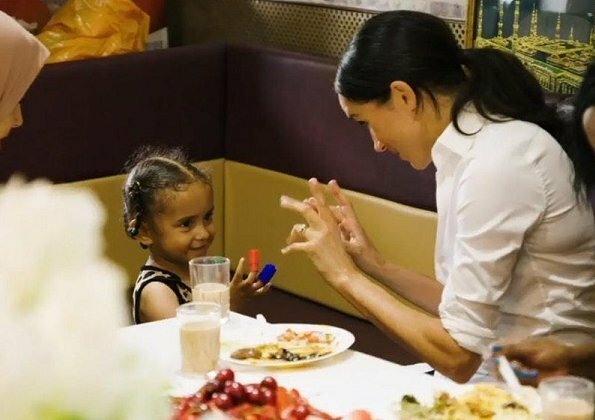 Yesterday, The Duchess of Sussex announced her first solo project as a member of the Royal family. The project is a charity cookbook which will help the community affected by the Grenfell Tower tragedy. The cookbook is supported by The Royal Foundation and published by Penguin Random House companies and its name is ‘Together: Our Community Kitchen’. The cookbook includes more than 50 recipes from women whose community was affected by the Grenfell Tower fire. 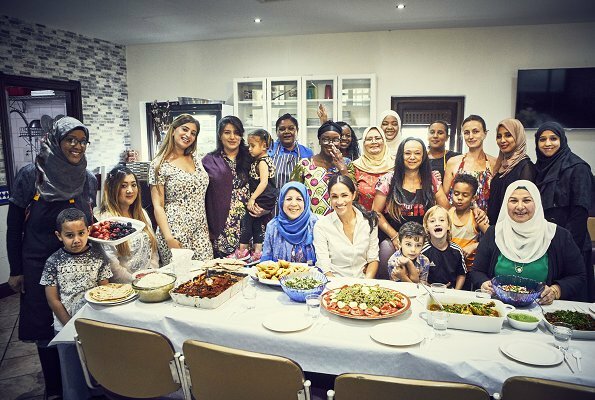 Last summer, a group of women got together in a communal kitchen at the Al Manaar Muslim Cultural Heritage Centre in West London, where they could prepare fresh food for their families, friends and neighbours. As they cooked together and shared recipes, they began to connect, heal and look forward as a community. Word spread and more women joined in – this was the start of the Hubb Community Kitchen. The proceeds from the book will support the Hubb Community Kitchen and will enable it to stay open and to thrive. 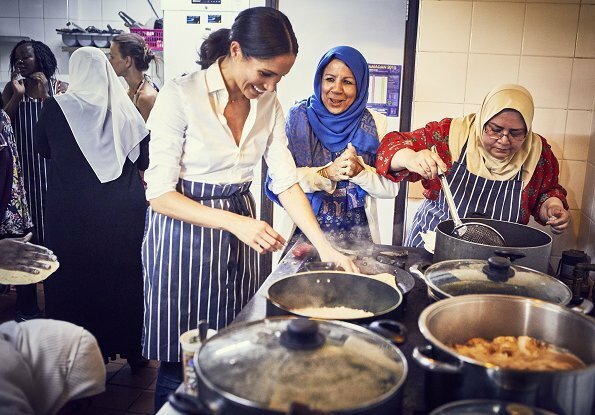 The Duchess of Sussex first visited the kitchen in January 2018 and continued to make regular private visits. 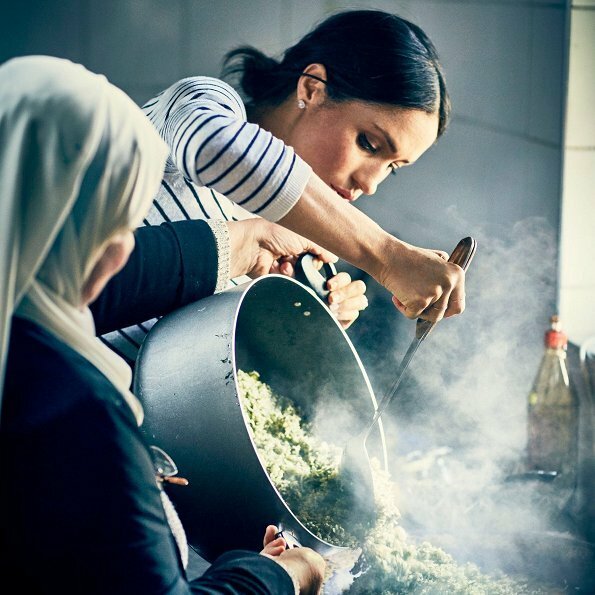 United by their passion for cooking as a way of strengthening communities, the Duchess was inspired by how the project empowers women at a grassroots level, and supported the cookbook project as a way of ensuring the kitchen can continue transforming lives and communities through cooking. 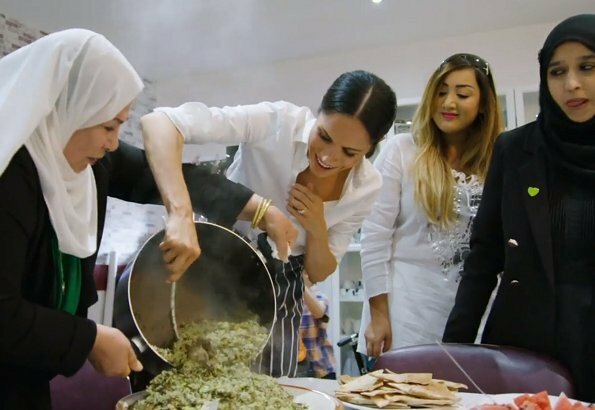 Duchess wrote the foreword for ‘Together’ which includes the women’s own personal recipes from across Europe, the Middle East, North Africa and the Eastern Mediterranean. There is a lot of wonderful stuff besides fashion going on in these beautiful, colourful photos. Meagan looks so real and so comfortable surrounded by, and working with, these women. This could be the start of some extraordinary things for her. Well done to the Duchess of Sussex!!! And the women looks so comfortable too. Bravo Meghan! I love how informal,happy, relaxed Meghan looks here! So different from the usual formal Royal Family duties. Hope to see more of her personality shine through in the future! Interesting project. There's a lot of prejudice about this middle eastern cultures, very nice of her. Hope this will be a scene we can enjoy more often. Wonderful photos. Meghan looks totally at ease and it's easy to see the rapport between the Duchess and these women, really beautiful. 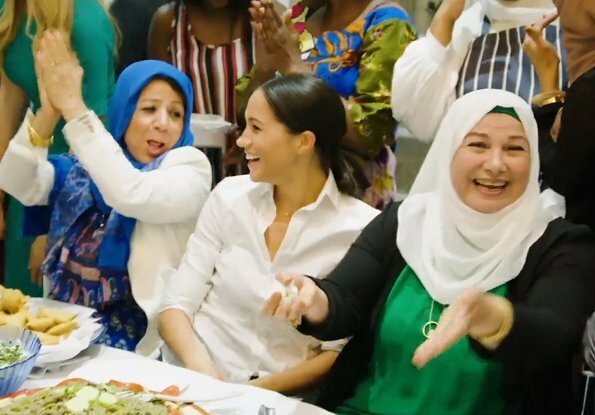 The Duchess looks happy and relax surrounding with this group of hardworking women, well done Meghan!! Looks a bit to much like Leonardo´s "Last Supper", it is too perfect. There always has to be someone. Well done Duchess of Sussex ! What a superb engagement of Meghan! She looks her best. Everybody seems to be happy and relaxed. And the food looks delicious, I love oriental food! Fabulous! She loves to cook and what a great start. I already ordered the book! I love to cook too! What a good idea, Diane, to order that book! Wonderful idea and well done! I just love how the comments here are not focused on "what Meghan wore" but on this wonderful engagement and the work behind it by raising awareness. I so agree! Such a wonderful cause with wonderful women. Meghan is shining! This is just a small snapshot of what the world should be like. Bravo! La duchesse semble bien exactement là où elle est, son sourire est doux et sincère c'est un vrai ravissement cette duchesse. Genuine care, not just lip service is what I think when I see and read this. There’s also a video that is very touching and just rings true. She isn’t just another pretty princess. She did all of this long before she met Harry. Now she has additional impact.